Leading off today: As noted half a century ago by one Mr. Robert Allen Zimmerman, the times they are a-changin'. Cailey Welch recorded a hat trick and Izzy Glennon scored two goals for North Shore in a 5-0 girls soccer victory over Rockville Centre South Side on Monday. Freshman goalkeeper Giuliana Graziosi made seven saves to record her second shutout of the season. "You let a team like South Side score a goal, it can open the flood gates," North Shore coach Lauren Gotta said. "Our goalkeeper made some good saves." The road victory, which included four first-half goals by North Shore, improved the Vikings' record to 2-0 in the Nassau County AB-1 division and 4-0 overall. Perhaps more significantly, though, it dropped South Side to 0-2 by a combined score of 9-0 thus far. As observers of the sport will tell you, South Side has been the gold standard of New York girls soccer over the years. The Cyclones earned 17 NYSPHSAA championships from 1987 to 2012 and made the state tournament as recently as 2014. More girls soccer: Senior Meghan Root scored her 100th career goal during Pioneer's 2-0 victory over East Aurora in a first-place matchup between ECIC III teams. Root scored both goals for the Panthers, each on assists from Erin Byers. Jasmine Sims made six saves for the shutout. Pioneer is 3-0 in the league and 6-0 overall. East Aurora i 4-1, 4-1-1. • Allegany-Limestone, ranked sixth in Class C, defeated Portville 2-0 to keep intact an amazing streak. A-L has rolled up a 46-0 margin in goals in the course of defeating Portville 12 straight times since 2011. Lending a hand: The New York State Public High School Athletic Association Inc. and Naples-based CP Sportswear have teamed up to donate more than 3,000 articles of clothing to the victims of Hurricane Harvey in Texas. Much of the clothing was NYSPHSAA championship from recent seasons, including 2,000 T-shirts, 352 pairs of sweatpants and 350 pairs of socks. In addition, Gunlocke Furniture in Wayland raised over $300 was used to purchase new socks for flooding victims. The NYSPHSAA said United Way of Texas assisted in coordinating the delivery of 68 boxes. NYSPHSAA and CP Sportswear made a similar donation a year ago to aid victims of flooding in Louisiana. Rankings progress: The first sets of cross country and boys soccer rankings were posted in the past 24 hours, and we hope to have girls rankings soon. Our opening set of football rankings will be released Wednesday. 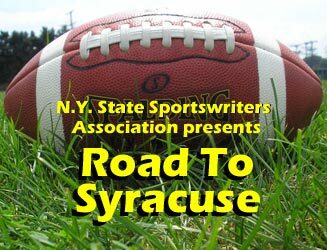 More than just the game: Syracuse.com put together a really nice package of stories and photos over the weekend capturing aspects of a high school football weekend that went well beyond the action on the field -- everything from team dinners the night before the game to watching the game through the perspective of an injured star player. Win some, lose some: Brown University broke even in the world of girls basketball recruiting over the weekend. Traiva Breedlove, a guard for Our Lady of Mercy in Section 5 who was eighth-team all-state in Class AA as a junior, committed to the Ivy League school after being pursued by a variety of programs from the MAAC, CAA and MAC, nychoops.net reported. Meanwhile, Hannah Strawn, a three-time all-stater including the second team in Class B for Federation champion Seton Catholic in Binghamton, changed her mind. Strawn had committed to Brown in the spring but had a change of heart and opted for Monmouth. Strawn had actually committed to St. Bonaventure as a sophomore but backed off after Jim Crowley left to take the Providence College coaching job.